Rob is currently busy on post production for a new Marianne Faithfull album, her 22nd as such, to be released over the summer. The album contains new materiel co-written with her by Nick Cave, Mark Lanegan, & Ed Harcourt, as well as some old favourites from her repertoire, re-recorded and given a new slant. 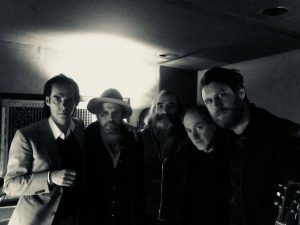 This remarkable album session, recorded by engineer/co-producer Head at La Frette studios in Paris features the Faithfull touring band of Rob, Ed Harcourt & Rob McVey with the very special addition in the studio of Nick Cave & Warren Ellis. Meanwhile Rob has been preparing instrumental arrangements and writing new materiel for a tribute performance to commemorate Nick Drake, who would have been 70 this year. Organised by Rob’s old Automatic Dlamini and PJ Harvey band mate John Parish, “Remembered for a while – The Music of Nick Drake” will feature Aldous Harding, Nadine Khouri & H Hawkline singing & performing some classic songs from the Nick Drake canon, and will also feature an original piece, specially written by Rob, that utilizes a recording of Nick Drake reciting his own poetry, and that Rob has set to a score for string quartet and alto flute. This very special evening takes place at St George’s, Brandon Hill, Bristol on 12th April. Early booking is recommended as the tickets for this smallish venue are bound to fly…see https://www.stgeorgesbristol.co.uk/event/john-parish-guests-remembered-for-awhile/ for details of the evening and ticketing. Marlon William’s new album “Make Way for Love” on which Rob wrote and arranged string and other instrumental parts for the track “Come to Me” was released in February on Dead Oceans records…the track was released as a single, and was described as “blissful” by Paste magazine, “luscious” by Mushroom.com and “swelteringly euphoric” (!) by AVClub. Copenhagen trio, Baby in Vain released their debut LP “More Nothing”, produced by Rob and released on Partisan records at the end of 2017…Clash Magazine said of it “Listening to the debut LP from Danish trio Baby in Vain is a bit like diving into an ocean: it gets heavier and darker the deeper you get”. See http://babyinvain.com/en/ if you’d like to dive in.